FAITH I BRANKO (SERBIA/UK) "Musically a delight…these virtuosic performers are a major discovery this year" - The Guardian, UK, 2016 “Moving, breathtaking and virtuosic” - Lopa Kothari, BBC Radio 3 Faith i Branko: Serbia’s No. 1 Roma violinist and UK accordionist perform high-energy original Roma/Jazz influenced music with an international quartet/quintet. 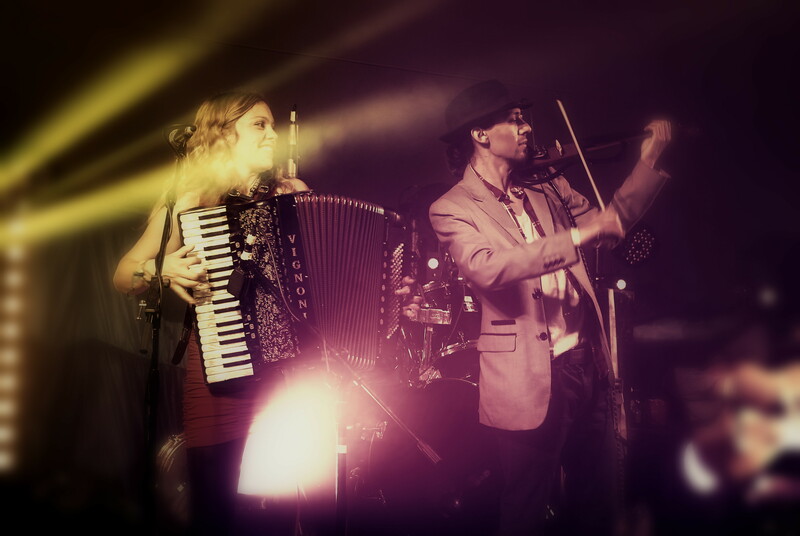 Branko Ristic, described by BBC Radio 3 as a violinist ‘whom Paganini would be proud of’ has joined with Faith Ristic - a UK performer who’s ‘nimble accordion playing provides a beautiful bedrock’ The Guardian. From a foundation of ‘Serbian-Roma’ music, they have created a style that draws from both of their musical heritages and expresses their unique personal connection. Recent highlights include The Royal Festival Hall, Kustendorf Film Festival & Edinburgh Festival; WOMEX award winning album ‘Gypsy Lover’ - produced by Emir Kusturica/ Nicholas Hooper is 11th in the European World Music Charts; radio play includes BBC Radio 3 Heritage Tracks. The duo met in Branko’s Serbian Roma village of Gornja Grabovica in 2009, and - with music as their only tool for communication - began a journey that would lead to the creation of their WOMEX award-winning album ‘Gypsy Lover’, their marriage and their success in international touring and media. Branko taught himself the violin, which became a way out of the extreme health, social and economic problems through which he lived in Serbia; he created his own music - intuitively combining sounds of Jazz, Indian, Turkish and Classical music with his Roma traditions. Now based in London, the duo are currently touring with their quartet and quintet. They appear regularly on Balkan/Roma TV and their biographical documentary ‘Duo’, is due to be released in 2018; they are recording artists on Emir Kusturicas' latest film with Monica Belluci; toured Australia and Europe (2015) – including Enlighten Canberra, The Basement (Sydney), The Homestead (Tasmania), Vienna Roma Fest, Guca Festival and Kustendorf Film Festival; recently completed a 2016 43 - venue tour of the UK, including the Royal Festival Hall, The Southbank Centre, Echo Founders Festival with Anthony Gormley, The Caves (Edinburgh), SOAS Concert Series, The Arts Centre (Glasgow), and are the composers and producers of their WOMEX award winning album, ‘Gypsy Lover’ - recorded at Serbian film Director Emir Kusturica’s Studio, mentored by Nicholas Hooper (Composer/Harry Potter) and released with Riverboat Records/World Music Network. Recent radio play includes BBC Radio 3 Heritage Tracks, World Service with Stephen Fry and 6 Music. 'Gypsy Lover' is placed in 11th position in the European World Music Charts.